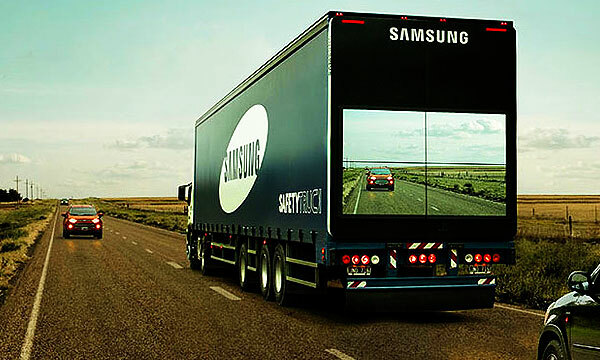 The current upsurge of road accidents mostly because of cars overtaking in a one-lane road has led Samsung to invent Big Trucks – a project aimed at saving lives instead of changing them. These trucks have a wireless network at the front, connected with the 4 screen video displays at the back. Back in 2009, Russian design house Art Lebedev introduced the ‘Transparentius Concept’ for enhancing road safety. It was an exceptionally simple idea: put a camera on the front of large, slow-moving trucks and connect it to video displays on the back, thereby informing trailing drivers whether it’s safe to overtake the big rig. That’s the exact same idea that Samsung is now pursuing with a new prototype truck. Since, the company has a great outdoor exposure, they stitched together a video wall of four displays at the rear of the truck, which transmits video captured by a wireless camera at the front. The idea is now under deployment despite the fact that it doesn’t appear economical. In the long term, installing a four display video screen would cost rather too much since it yields no direct benefit. Still, it’s impressive that Samsung has managed to overcome the technical challenges (like the solar glare) for executing this laudable idea. Vehicle-to-Vehicle Communication (V2V) system came up with a more pragmatic idea which will be installed in American cars next year. This is a form of networked intelligence whereby the car transmits data about its position, direction, and speed and receives the same about cars around it. It can thus issue alerts about unsafe driving by others or notify of any collisions ahead even before any other drivers have had the time to react. In a way, V2V Communication does more than just give the drivers behind a vision, even though making big transparent trucks are definitely a much cooler application of technology.